When it comes to attracting new customers, it’s likely your online presence is a large contributor. In the digital age that we live in, many individuals will first connect with a business via their website or social media page. 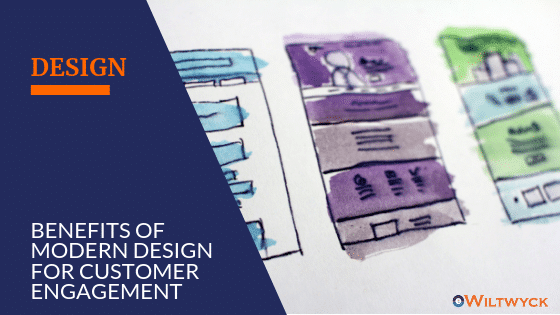 For this reason, it pays to keep your website modern so that you can utilize the best of tactics for enhancing your customer engagement for the long-term. If users land on your website, it’s very likely they’re searching for your products or services. To help them contact you in order to receive those products or services, you’ll want to make it as easy as possible. With modern web design, you can opt for interactive chat boxes that can allow you to connect with these customers around the clock. You can answer their questions and even schedule them for service. By having this modern form of communication, your customers are more likely to engage your staff via your website than without a chat box. With the use of mobile devices, having a responsive website is a must. This allows users on all devices to clearly access all the parts of your website without any loading or formatting issues. This includes smartphones, tablets, and desktops. This responsive theme can make it easily possible for you to include your business contact information in the header or the footer of your website. By making it very easy to see how to get into contact with your business, you’ll be likely to engage more customers to view our services. It’s no surprise to anyone that people connect via physical impressions and pictures. Users want to see what your business looks like. They want to know what your service vehicles and staff look like. This can make them feel more comfortable and create a subconscious connection with your business. Think about it like this. If there are two websites, one that has blocks of text talking about their services and one that has pictures and text for their services, which one are you going to feel more connection with? Obviously, the company who chose to post pictures of their services will be more appealing. Never discount photographs in WordPress website design services. When you need a professional service, what’s the first thing that you do? Apart from asking those around you, you jump online and see what the internet reveals. Once you get a list of companies, you scour their websites to see if they offer the specific service you need. It’s likely you’ll pick the website that you feel a connection with. If a company on your potential list of service providers to check into doesn’t have a website, it’s likely you’re going to skip over them for someone that does. It’s simply not advisable to be in the 21st-century service business and not have a website for your customers to connect with. One of the best parts of modern web design is a website’s ability to alert you when something isn’t working properly. Whether the load time of your pages has severely slowed, you have an overload of users on your site, or your pictures aren’t loading correctly, new technology can alert you to the need for website maintenance. This can save you from missing out on many new customers due to a downed website that you let go for days because you didn’t realize there was a problem. If you sell products online, it’s likely that keeping your customer’s sensitive data secure is one of your top priorities. With so many credit card hacks, many customers may refrain from using websites they don’t trust as they don’t want to be the next victim of fraud. Luckily, with modern web design, you can integrate trusted payment checkouts that will make your customers feel more comfortable inputting their information. These include merchant portals like Skrill and PayPal. When you have these checkout options on your website, many users are going to be more likely to engage in purchasing products on your website than if you didn’t have these portals. Keeping up with modern web design is no longer a can do, it’s a must do. If you want to stay in line or surpass your competition you need to make sure that your customers are engaging with your website. With the help of a skilled website designer, you should be able to work consistently to improve your engagement stats and make them better each month.